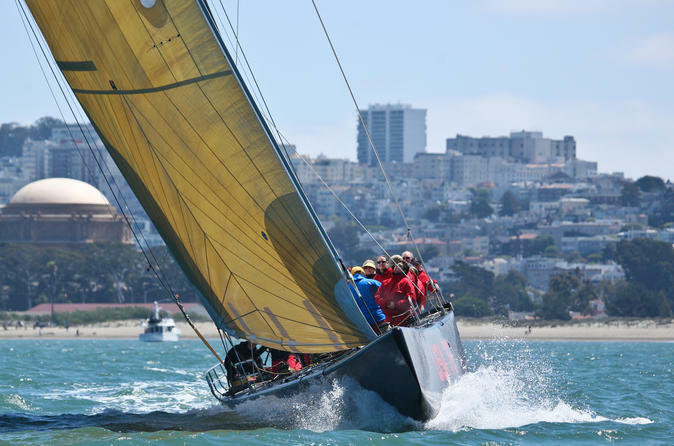 Welcome aboard for a family friendly 2 hour San Francisco Bay sailing tour aboard USA 76, an International America’s Cup Class racing yacht that challenged in 2003 for sporting’s oldest active trophy, the America’s Cup. Our Express Sails operate with reduced sail area which means we will sail with just the jib sail (forward sail) and will not be using the main sail on this trip. (jib only). Departing from PIER 39 in San Francisco on select summer afternoons. Participation is encouraged! You get to fill active crew roles and will have the opportunity to spin the sail trim controls known as “coffee grinders,” take your turn at the helm, or simply sit back and enjoy the ride on this high-performance America’s Cup racing yacht. While we are sailing you will enjoy spectacular views of San Francisco and the surrounding communities. We have complimentary water and energy bars available during the sail. There are no restroom facilities aboard this race yacht so we will instruct you where to use the restroom on land before departure. Our crew enjoys sharing their knowledge about the America’s Cup and sailing on San Francisco Bay so bring lots of questions. If you enjoy your experience, gratuities for the crew are greatly appreciated. Both your Captain and the yacht are licensed by the U.S. Coast Guard for passenger service. USA 76 is a very stable yacht and seasickness is never a problem for our guests. USA 76 can accommodate up to 20 guests at a time.